With mosquito season in full swing, concerns over the Zika virus continue to climb—making one Brazilian scientist’s cutting-edge work particularly timely. 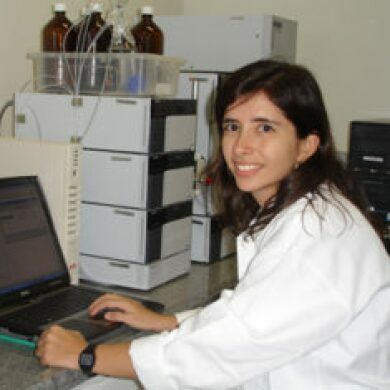 Leda Castilho, Ph.D., a professor at the Federal University of Rio De Janeiro’s Alberto Luiz Coimbra Institute of Graduate Studies and Engineering Research, was named the winner of Johnson & Johnson’s Latin American QuickFire Challenge in February for research that her team is currently conducting on Zika—research that has the potential to lead to a vaccine. The QuickFire Challenge—spearheaded by Johnson & Johnson Innovation, JLABS, in collaboration with pharmaceutical company Janssen Brazil—was created to encourage the development of innovative healthcare technology focused on preventing and eradicating diseases in Latin America. The challenge’s grand prize? A six-month residency for Castilho and her team at JLABS @ TMC, a state-of-the-art new research facility in Houston, TX, where they will have access to top-notch technology and fellow scientists. We caught up with Castilho to hear more about her team’s work with the Zika virus—and how their efforts may one day help vanquish it. What inspired you to enter the QuickFire Challenge? When we heard about it, we knew it was a wonderful opportunity. JLABS not only has state-of-the-art equipment and facilities, but they’re surrounded by other eminent research institutions in Houston. It’s perfect for networking, which can help accelerate our research. be delivered here—and at about a third of the cost. Plus, since we now have teams based in both Brazil and the U.S., it’s going to help us work more quickly. When did you start studying Zika? I’d been working in the lab to develop a vaccine for yellow fever, which is a flavivirus. It belongs to the same virus family as dengue, West Nile and Zika. But when Zika hit, my rationale was that everyone who had been working on a related virus should start looking at Zika so we could make progress as quickly as possible toward a treatment or vaccine. Many people in Brazil who were working on dengue fever actually shifted to focus on Zika, as well. What is your Zika research focused on? We’re trying to develop virus-like particles (VLPs) that resemble the outer surface of the virus. VLPs will potentially have three important uses. First, we can use them to create new diagnostic testing tools, which is critical at this point because it’s hard to currently distinguish a Zika infection from a dengue infection, for example. Second, it can help us produce a hyper-immune serum, which is sort of like the anti-rabies or anti-snake venom serums. A serum can be used as an emergency tool to reduce the viral load in people who are infected. And the third application for VLPs is a vaccine. A VLP-based vaccine would be safer than most other vaccines because, unlike vaccines made from dead viruses or live attenuated viruses, it doesn’t contain any genetic material from the virus. What do you hope to accomplish over the next six months at JLABS @ TMC? We’ll finish our stay just before Christmas and we hope to have purified VLPs in place to give to our Brazilian serum producers, so they can start developing the hyper-immune serum against Zika. Just thinking about it makes me excited! Once you have the purified virus-like particles, how long will it take to develop a vaccine? At least several years because you can’t give a vaccine to humans until it’s been thoroughly tested—and that testing could last at least a couple of years. It’s a rigorous process, but there’s no other way to ensure that it’s safe and efficacious. Are there any Zika-related myths you’d like to dispel? I realize there are concerns about the Olympics being held in Rio de Janeiro, but what people need to know is that August is our winter, so it’s not mosquito season. Researchers recently did a study based on the last 14 months of data on dengue fever and Zika. They’ve predicted that if half a million people come to Rio for the Olympics, maybe 15 or 16 people will become infected. Considering that there is now active Zika transmission in about 60 countries, the impact that the Olympics in Rio will have on the epidemic is really quite low. The thing that is a cause for concern is when a pregnant woman becomes infected because the virus can be transmitted to the fetus and cause microencephaly, a serious birth defect in which a baby’s brain doesn’t develop properly. So pregnant women should avoid travelling to any area with active Zika transmission. So until we have a treatment or vaccine, people living in affected areas should take immediate action to reduce their risk. The mosquitos that carry Zika like to live inside homes, rather than outside, and you can prevent the mosquitos from proliferating by getting rid of any standing water in and around your home where they can breed. Though I don’t know any women personally who were infected with Zika while pregnant, hearing about those cases breaks my heart. If we can develop better diagnostic tools, we’ll be able to identify pregnant women who’ve been exposed. If we had a hyper-immune serum, we could potentially give it to a pregnant woman to decrease her viral load and try to minimize the likelihood of transmission to her fetus. And, of course, the most important outcome of our research would be to have a Zika vaccine. Rubella, or German measles, caused malformations in fetuses, too, and those devastating complications were avoided once rubella vaccination became widespread. Vaccines are the most efficient and effective tool we have to protect people’s health, so that’s the ultimate goal. Several research groups in different countries are working on the development of a vaccine for the Zika virus. If one of us can achieve that, then it will be a huge accomplishment.